Honeycat Cookies: Chocolate Concrete, Recipe! Poor photo. I considered making another, in order to get proper pictures, but that's an AWFUL lot of chocolate concrete there, and I'm at home all day, looking at it. We used to have this regularly at school and it was amazing. Hot and gooey, very sweet. Not like the rich chocolatiness of brownies, more cakey. I never had custard on mine (I don't do custard). Cold it was chewy and sort of hard, hence the name. I used to make it at home too, after the school sold a spiral bound recipe book of school dinners for tenpence. It had very odd quantities, as I guessed they'd simply divided a bulk recipe by the number of eggs. I remembered it recently and googled. It seems there are a few versions out there. Some people remember it being very hard when cooked, like a shortbread, and some of the recipes have no egg in them and the fat is rubbed in, which would make a shortbread, but I know there was an egg in ours, because the raw mixture tasted fabulous after adding the melted butter, and then not so good with the egg in. A lot of people had it with pink custard, or peppermint custard, which is odd. 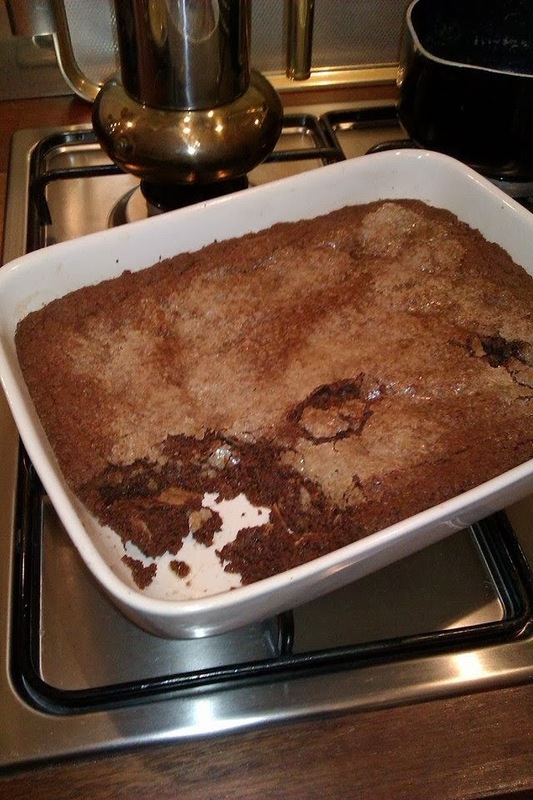 Anyway, I had to spend a lot of time inside google before I finally came across this recipe in a forum, unfortunately with a broken link to its source, with odd quantities that rang bells, and it worked. Mix the dry ingredients together, melt the butter and mix into the dry ingredients. Add the beaten egg. Press into a tin or dish of the right size (you'll have to guess - make the mixture rounghly 3/4 inch thick) which has been greased. Lightly brush the top with water (I just used my fingers) and sprinkle with a little more granulated sugar. Cook at 180c for 25 minutes. Let it rest a few minutes before trying to serve as it will fall apart. And be too hot to eat. And you will get a burned tongue if you try to dig a hole in the middle and eat some to see if it's cooked already although you know better than to do such a silly thing. And if you've just done that, learn from it. Don't dig another hole and do it all over again.